For travelers looking to get far off the beaten track this summer, a rare Arctic expedition may fit the bill. “All voyages to our planet's polar regions are special, but the Arctic Islands expedition visits places that few other people will ever see,” says Pat Shaw, President of Quark Expeditions. • Svalbard archipelago, the world's northernmost inhabited land (land that humans share with polar bears) • Northeast Greenland National Park, a UNESCO Biosphere reserve larger than the state of Texas Over the course of the voyage, we will visit known habitat of polar bears, whales, seals, Arctic foxes, walrus and reindeer. The trip includes an overnight stop in Helsinki, Finland, a beautiful and intimate city known as "the Belle of the Baltics." Rates for this 17-day expedition start at US$19,500 per person for a standard twin cabin. 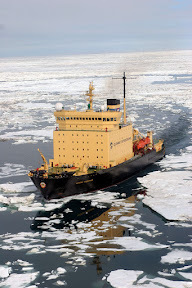 About the Ship: This expedition is offered on Kapitan Khlebnikov, a helicopter-equipped, polar-class icebreaker. Khlebnikov carries only 108 guests. The ship's two helicopters are used for ice reconnaissance, aerial sightseeing and shore excursions. Between landings, guests can socialize in the ship's lounge and bar, heated indoor swimming pool, exercise room and sauna. About the Operator: Connecticut-based Quark Expeditions is the world leader in polar adventure travel. Quark operated the first-ever passenger voyage to the North Pole, and the first full circumnavigation of Antarctica. Cabins can be booked through Quark Expeditions by calling 1-800-356-5699 or +1-203-852-5580.